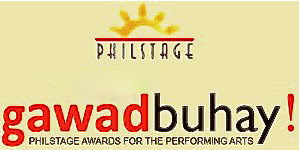 The Philippine Legitimate Stage Artists Group, Inc. (Philstage), in cooperation with the Cultural Center of the Philippines, will confer the 2009 “Gawad Buhay! : the PHILSTAGE Awards for the Performing Arts,” on Friday, March 26, 2010, 7:30 p.m., at the Tanghalang Aurelio Toletino (CCP Little Theater). The awards show is free admission and open to the public. An independently juried peer award, Gawad Buhay! is the first-ever industry awards exclusively for the performing arts. Ninety-five artists and productions vie for 30 individual and group award categories honoring outstanding achievements in play, musical and dance productions of Philstage member-companies for 2009. “With the excitement building up after the award’s maiden edition last year, we expect bigger support from the artists, our friends in the media and our audiences for this year’s ceremonies,” said Fernando Josef, Philstage president and artistic director of Tanghalang Pilipino. A distinguished achievement award called “Natatanging Gawad Buhay!” will also be conferred to artists and corporate supporters who have contributed significantly to the professionalization of Philippine Performing Arts. Philstage is the country’s only organization of professional performing arts companies with regular season programming of repertory development and performance pedagogy training. Its Board of Directors include PETA's Melvin Lee, vice president; Ballet Philippines’ Sandy Hontiveros, secretary; Repertory Philippines' Gidget Tolentino, treasurer; Actors Actors’ Leonardo Lim, Ballet Manila's Susan Macuja, Gantimpala Theater Foundation’s Tony Espejo, Organisasyon ng Pilipinong Mang-aawit’s Mitch Valdes, TRUMPETS' Audie Gemora and PHILSTAGE Executive Director Elmar Beltran Ingles as members. The Gawad Buhay! 2009 jury is composed of Exie Abola, Walter Ang, Gilbert Cadiz, Ronald Elepaño III, Arvin Ello, Ralph Semino Galan. Rolando Inocencio, Glenn Sevilla Mas, Joy Parohinog, Joey Ting, and Basilio Esteban Villaruz. PLUS: All about the Gawad Buhay! awards here. Nonon Padilla, Saan Ba Tayo Ihahatid ng Disyembre? Tony Perez, Saan Ba Tayo Ihahatid ng Disyembre? Lex Marcos, Saan Ba Tayo Ihahatid ng Disyembre? Juliene Mendoza, Saan Ba Tayo Ihahatid ng Disyembre? Jack Yabut, Saan Ba Tayo Ihahatid ng Disyembre? Jed Balsamo, Saan Ba Tayo Ihahatid ng Disyembre? Salvador Bernal, Saan Ba Tayo Ihahatid ng Disyembre? Ian Torqueza, Saan Ba Tayo Ihahatid ng Disyembre? Aries Alcayaga, Saan Ba Tayo Ihahatid ng Disyembre?